Happy Canada Day! Let’s start the month with a little design recap. It’s summer time, and I know that we spend more time traveling and exploring our surroundings instead of staying close to home in the studio. There is no reason to neglect our design studies. With this said, I spent yesterday at the Annual Claybank Heritage Day Event. The site is a Canadian National Historic Site that operated from 1914 through 1985. 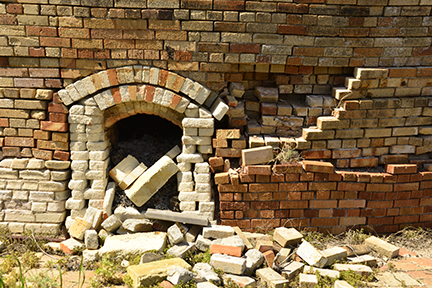 It produced a variety of bricks, including fire bricks for kilns. Bricks were shipped near and far. 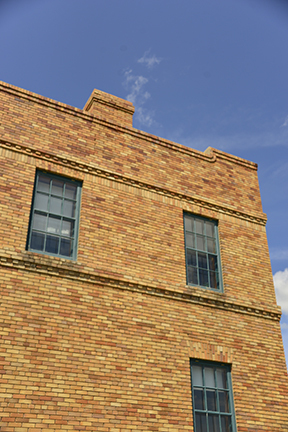 Moose Jaw and Regina have numerous buildings that used this brick. Even Chateau Frontenac’s exterior in Quebec City is made of Claybank Brick. Read more about it here. 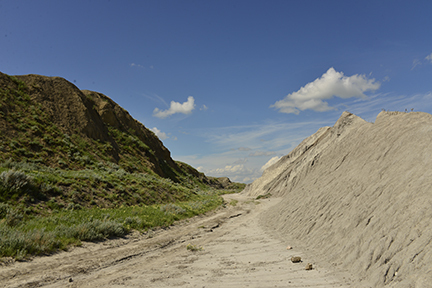 A sunny day made for large crowds – for Southern Saskatchewan. The field designated for parking was fully utilized. By 2 p. m. the activities were well under way. A brief visit to the Bunkhouse to inform ourselves about the historical significance of the site helped to orient ourselves. My camera got another workout, this time during the day with people all around. I love junk yards and architecture – this time I felt I had died and gone to heaven… just kidding! There was rusty metal, a variety of distressed surfaces, pattern and line!…So many lines: converging, dissecting, aligning and enclosing – thin lines, thick lines, broken lines and suggested lines. I captured well over 500 images, but will not bore you with them here. I have selected a few key images that I thought might inspire some designs on your part. Enjoy! A detail of the refurbished bunkhouse draws the eye high into the sky. Horizontal lines dominate the upper story. Another detail of the bunkhouse where line leads the eye across the second story. Note the variation of scale with the large rectangle that frames the window, which is divided into smaller rectangular panes. 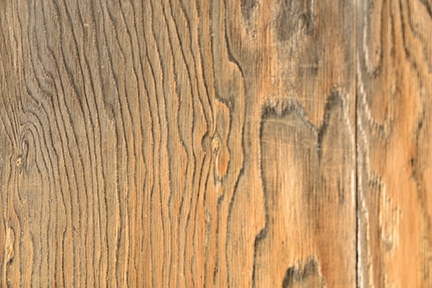 The surface of a weathered wooden door beckons to be touched to trace the undulating vertical lines. 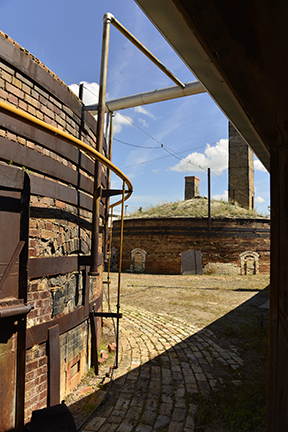 Another view of the kilns from the main brick plant building; the rhythmical stomping of the machinery behind me made the plant come alive for another day. 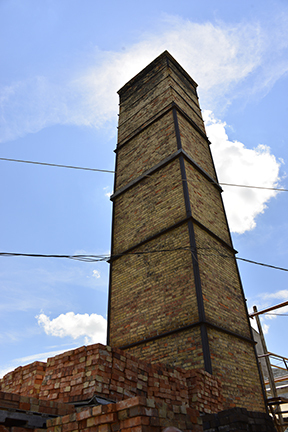 A tall, well maintained chimney reaches high into the sky. Lines that create shapes and pattern assisted by the interplay of light and shadow – a feast for the senses. 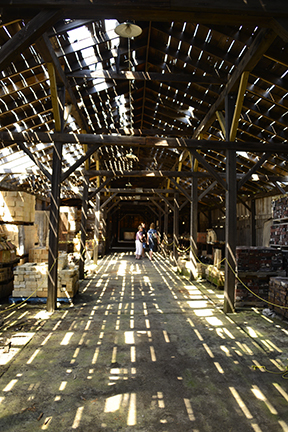 I discovered this scene in the building that houses the reclaimed brick. 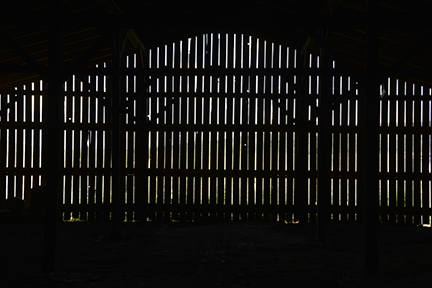 This wall was at the end of the concession barn – the late afternoon sun pushing in to the cool darkness. A retired machine placed in front of an open window made for an interesting positive/negative space called to be framed by my camera. 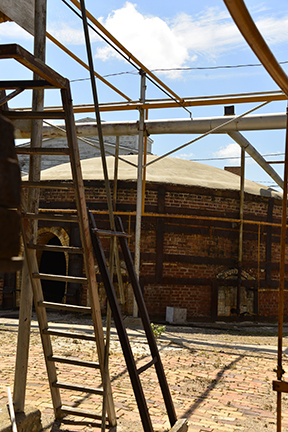 A large brick with a perfect hole, a circle within the circle! 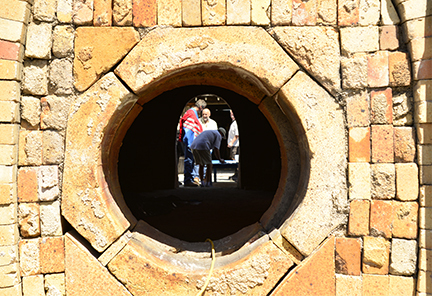 A peephole leading the eye into the kiln and through the loading portal is the immediate focus of this composition. The various patterns surrounding the opening reminded me of a quilt pattern. This image reminded me of the state of this historical site. 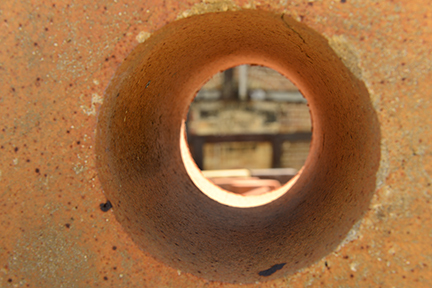 The kiln appears to be spilling new bricks from its mouth… A feast for the eye of pattern and lines! A ride into the hill on hay bales brought us closer to nature. 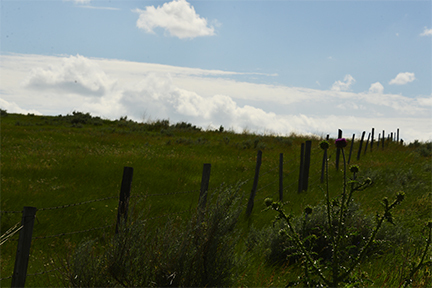 A fence along the path lead the eye into the distance. 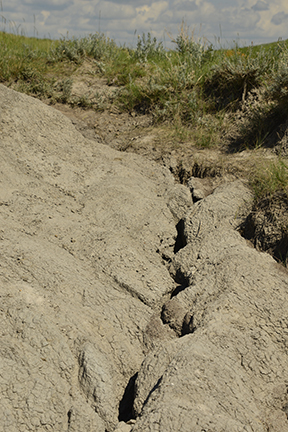 Upon closer inspection of the clay deposits water erosion is evident – a snaking line has created a deep furrow along the base of the clay hill. Enjoy your day and stay creative! 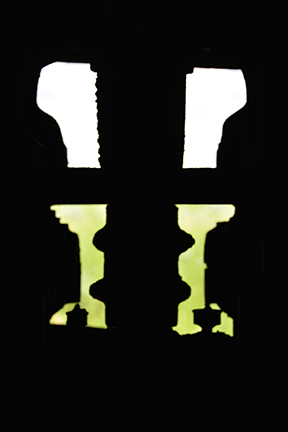 Have a look around you today and take note of special lines and shapes… Don’t forget to take your camera along. 01 Jul	This entry was published on July 1, 2013 at 6:10 am. 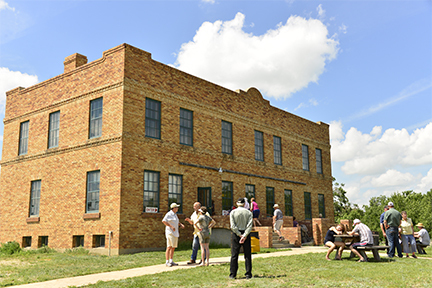 It’s filed under Art, Design, History, In the News, Journaling, Photography & Events, Travel and tagged architectural photography, Claybank Brick Factory, Claybank Heritage Day, Design, design lesson, line, Photography, Saskatchewan, Shape, Southern Saskatchewan. Bookmark the permalink. Follow any comments here with the RSS feed for this post. 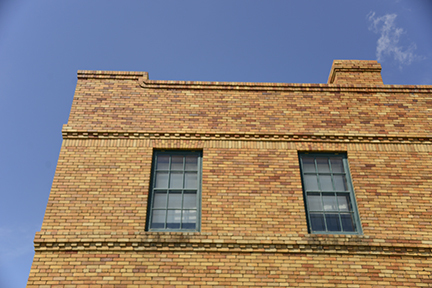 Perhaps we should return to bricks … Century plus homes still stand proud. Our modern homes are beaten by the weather and time. Yes, Vivian! My sentiments exactly – growing up in Germany and now making my life in Canada I sorely miss the permanence of brick buildings.